The Giant Brazilian Otter (sometimes called the Brazilian Otter) is the larger of the two subspecies of Giant Otter and is part of the mustelid (Weasel) family. The Giant Brazilian Otter has a body length of 180 cm (including tail) and weighs up to 34 kg. Giant Brazilian Otters have dark brown, water repellent fur, with white patches on the chest, neck and throat that are unique to each individual. They have short legs with webbed feet and a long powerful tail to propel them through the water. Giant Brazilian Otters also have large eyes and long whiskers to help detect prey in the water, and nostrils and ears that close in the water. Giant Brazilian Otters are highly social, living in family groups of between five and eight individuals and, sometimes up to 20. These family groups consist of a male and female, which mate for life, and offspring from previous years. The female has up to five cubs in an underground burrow, which stay with their parents until the birth of the next litter or even longer, usually leaving the parents when they are sexually mature at around two years old. Giant Brazilian Otters are diurnal (active during the day) and rest in their burrows at night. Feeding is variable depending on seasonal migrations of food supply. Giant Brazilian Otters are piscivores (prefer to eat fish), but when fish supplies are low they will also hunt crustaceans, small snakes and small caiman. Adult Giant Brazilian Otters can eat up 4 kg of food a day. As part of their social behaviour, Giant Brazilian Otters clear large areas along the river bank for digging burrows and to create plenty of room for playing, grooming, hunting, and resting. Communal toilets are placed along the perimeter of these cleared areas to mark territory, with parents defending their offspring and territory from intruders. So far, nine vocalisations of the Giant Brazilian Otter have been distinguished, including screams of excitement and coos made on close contact with family members. The Giant Brazilian Otter lives in South America in the Amazon and Orinoco basins from Venezuela to Paraguay and South Brazil. 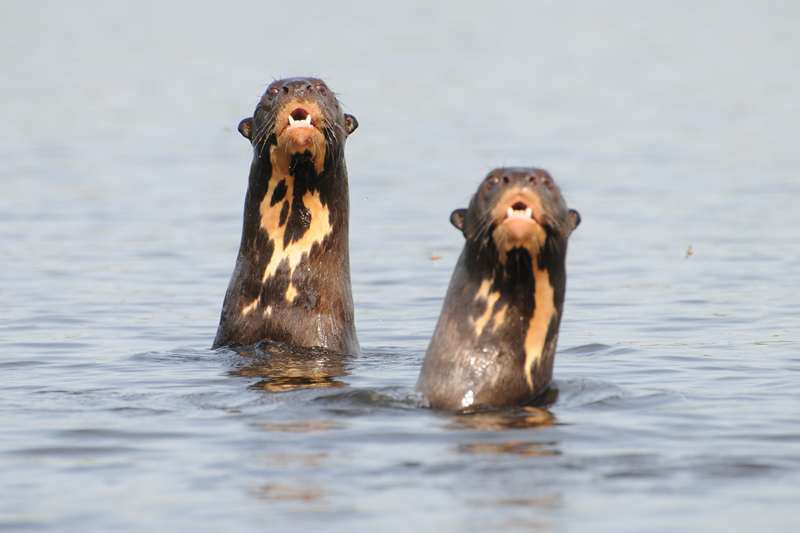 Giant Brazilian Otter populations in Uruguay and Argentina are thought to be extinct. 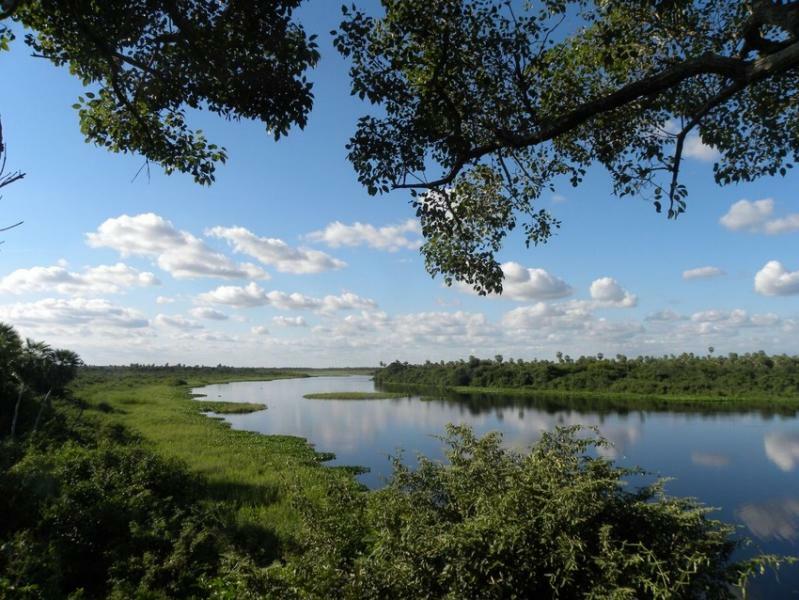 They inhabit slow moving rivers in forests, swamps and marshes, preferring clear water with gentle sloping banks and over hanging vegetation. They are also found in lakes and reservoirs. Estimates of how many Giant Brazilian Otters remain in the wild vary between 1,000 and 5,000. Giant Brazilian Otters are protected throughout their distribution, but still suffer many threats. They have very few predators although cubs may be eaten by caiman and jaguars. Humans are the largest threat and hunt Giant Brazilian Otters illegally for their fur and meat, or capture them alive for the pet trade. Gold mines also negatively impact Giant Brazilian Otters, as mercury, used in the gold mining process, contaminates waterways and their food sources. Meanwhile, overfishing reduces the fish that Giant Brazilian Otters prey on. Giant Brazilian Otters are also particularly vulnerable to exotic diseases. Habitat destruction followed by humans moving into their habitat is believed to have the potential to reduce Giant Brazilian Otter population by 50 per cent over the next 20 years.